It looks like a green sausage but what is it? 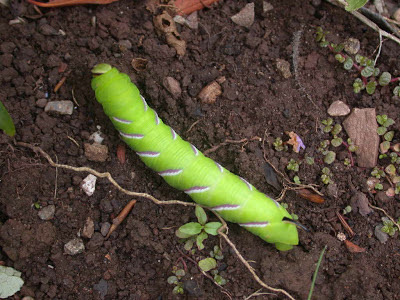 Ok, so it's a caterpillar but do you know what type is it? Found in urban areas, forests and woodland habitats in the south of England, it truly is a spectacular creature with it's bright green body, distinctive stripes and black horn. It pupates overwinter in the leaf litter to emerge as one of the largest lepidoptera found in Britain. As an adult it is full of colour, yet it camouflages itself well. There may well be some in your garden and you might not even know it.